In our living room there is a large picture window, spanning about a third of the long room. The three-sided window offers a spectacular view of the mountains, sweeping from the Presidentials in the east toward the Franconia and Kinsman ranges in the southeast, and it is this view which most often catches the attention of visitors. For me, though, the window provides a view more dear than the mountains of home. Through the window, I see the seasons changing, the days turning from sherbet-hued sunrise to alpenglow dusk, my children playing and growing. This is the window to my world. From the window, I can see the field where my husband and I stood with our friends and family one sunny, late-August day and promised to love, put up with, and celebrate each other the rest of our lives (not in those exact words, but that’s pretty much what marriage vows boil down to). When my children were babies, I spent countless hours, fuzzy with sleeplessness, rocking and feeding them by the window. From my perch in the giant recliner, I would watch the sun come up as I figured out how to be the mother of newborn twins and, later, another babe. While they dozed, I would gaze out that big window, watching the chickadees flit from bare lilac bushes to bird feeder, busily surviving in late winter, all of us waiting for the brightness and warmth of spring sunshine. Those babies are nearly 7 now and spend much time by the window and the bench seats below it. They sit at the table there to do their homework, create artwork, watch the snowcats moving up and down the slopes of Cannon Mountain, and look for animals and birds. The chickadees still come to the winter feeder, along with a pair of blue jays and an occasional passing flock of gold finches or cedar waxwings. In the fall we look out to see bears climbing the apple trees, and peer into the creeping dusk looking for deer. We’ve come to know the deer who frequent our field: the large doe and her not-quite-grown youngster, the young buck with only one spiky horn, a handsome 6-point buck, and an even larger one who appeared only once (that we saw), the day after the long hunting season ended, walking regally through the field, unbothered by the barking dog. From the window I gaze into the quiet of early morning, before anyone else is awake, looking for the silhouette of mountains to emerge from the darkness, trying to determine what type of day it will be. Red sky in morning? Sailor (or skier, hiker, bicyclist, gardener) take warning. From the window we watch the clouds pushing through Franconia Notch and the moon rise over Lafayette. I can watch the seasons change through the window, from the intricately bare branches and snow of winter to the pale pink blossoms that fill the apple trees in spring, then the purple burst of summer lupine, the yellows and golds of late summer, fall’s final surge of patchwork color, and back to white again. From the window I am watching my children grow, from toddlers peddling tricycles to kids building bike jumps out of logs and plywood. From not-quite-2-year-olds shuffling around the driveway on plastic, strap-on skis to daredevils plunging head-first down the snowy hill on sleds. From babies crawling through the grass to builders orchestrating major sandbox excavations. Our house could be described as “lived in,” with dirt on the floors, toys often scattered through several rooms, and clutter on the tables. The bumped-out spot where the window is may be the most lived-in place of all, the table piled with kids’ homework assignments, my notes, magazines, crayons, laundry to be folded. Not surprisingly, all three wide panes of the window are perpetually smudged with small fingerprints. The children push their hands against the glass as they look out at the deer and the chickadees, or watch for someone to come down the long driveway – my husband returning home, grandparents stopping in for a visit, friends coming to play. Someday I will watch from the window for them to return from first dates, college semesters, and new lives in other places. From the outside, the window also provides a glimpse into home. When we return on dark December evenings, we see the twinkling glow of Christmas tree lights. There are often kid creations hanging in the window – cut out paper snowflakes and painted candy canes in winter, flowers and shamrocks as spring approaches, the favorite drawing of the week. When I return home from a solo outing, I see my family through the window, building puzzles, playing games, reading books. Whichever way I peer through the glass, it is a window to the world my heart holds dear. Original content by Meghan McCarthyMcPhaul, posted to her Blog: Writings from a Full Life. This column also appears as Meghan's Close to Home column in the December 27, 2013 edition of the Littleton-Record. Amid the tree trimming, letters to Santa, cookie making, and present wrapping madness of the holidays, I take a trip each year down memory lane, perusing photographs from the past 12 months in the process of creating photo calendars for family members. It is a fun ritual to look through the photos of the past year, deciding which to include in each calendar, and remembering some of the things we’ve seen and done. A year’s worth of photographs stretches from winter outings into springtime mud puddles, summer fun, the colors and activities of fall, and back to winter again. Around we go. Every photograph offers a glimpse into one moment of time, and each one evokes emotions and memories. Every image comprises a story, or at least the introduction to a story. Of course, the moments we photograph and save are generally the happy ones, whether big events or impromptu clicks of the camera during good times. In this way, we commemorate the joyful and proud moments and ignore the less-than-cheery events. Looking through photo files of the year gone by takes me quite a while, as I become sidetracked by the details I’ve already forgotten, things that would likely fade from memory without those images to hold them: the happy-and-a-little-bit-nervous smiles of the first day of school, giggling walks through the lupine field, spontaneous living room dance parties. Contained in the 2013 collection are a summer week on Cape Cod, an autumn trek to Montreal, visits from the cousins from Tennessee and California, a wedding celebration, and plenty more: bike rides, hikes, holiday festivities, jumping into leaf piles, skiing through snowy glades, the intricacies of constructing fairy houses and decorating the Christmas tree. Looking beyond the most recent set of photographs to images from years past, I remember my children’s toothless baby grins, how crazy the littlest one’s hair was when she was tiny, the furrowed brow my son often wore as an infant, and that the sweet-bordering-on-mischievous gleam in my eldest daughter’s eyes is the same now as it was in her earliest months. I remember how my children, as toddlers, loaded freshly harvested carrots and potatoes into their Tonka trucks and carted them from the garden to the house, the springtime bouquets of bright dandelions they picked, their first snow angels, my then-2-year-old son teaching his baby sister to crawl, that baby’s first bike ride without training wheels, how grown up my daughter seemed in the costume for her first dance recital. In photographs I see that some of the outings my family enjoys now are similar to the adventures I had as a kid. I have a picture of myself around age 6 helping my father build something, and one of my son at the same age wielding a hammer with his grandfather. I have a photograph of the pigtailed little girl I was sitting at the top of a hike with my mom, and one of my own two daughters in nearly the same spot with her a few decades later. The kids will clamor to flip through the new calendars when they arrive, before we wrap them up and put them under the tree, remembering together some of the fun of the year just passed. 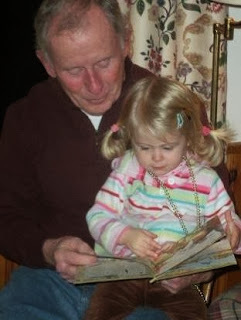 They also love looking through the older calendars and the baby books, finding within the pages their smaller selves and remembering the stories contained in these photographs. As the year comes to a close, the 2013 calendar will join the small stack of calendars from previous years, which we’ll dig out of the closet every now and then, flipping through the memories. And before the 2014 calendar is unwrapped and hung on the wall, we’ll have begun taking the next round of pictures, creating new stories as a new year glistens on the holiday horizon. So the world turns. Around and around we go, snapping photographs, holding onto moments, and replaying memories along the way. Original content, posted by Meghan McCarthy McPhaul and posted to her Blog: Writings From A Full Life. This essay also appears as Meghan's Close to Home column in the December 13, 2013 edition of the Littleton Record. It’s November, the month of giving thanks, which precedes the month of giving (and getting) gifts. As much as I love the spirit of Christmas, with all its twinkling lights and excited children and peaceful good deeds, I have always cherished Thanksgiving. This is the calm before the frenzied holiday storm, a time of gathering family and eating good food together. Thanksgiving is a holiday that inspires us to look around and see all that we have to be thankful for – rather than brainstorming items to add to our Wish List. There are myriad studies indicating that expressing gratitude is good for your health. Being thankful, they say, leads to better sleep, better mood, better physical and mental fitness. It seems logical that appreciating what you have will make you happier than lamenting what you don’t. Still, in the regularity of daily routine, I often find myself taking many things for granted: food on the table at each meal, a warm house, a car that starts when I want it to, a really spectacular view from my window. For my children, who have known all these things for all of their lives, taking for granted is natural. And so, some time ago, in an effort to ease the taking-for-grantedness of our lives, we started a nightly ritual of sharing our “thankful things” around the dinner table. Saying our thankful things seems more introspective, as each person’s “things” change from day to day, depending on what has recently happened, what kind of mood we’re all in, and whether there’s some longed for event coming up. Often the kids give similar answers. “I’m thankful for my whole family,” is a common one. Being thankful for our good food is another regular, especially when a favorite meal is on the table. The children regularly express thankfulness for some event from the day – playing with a certain friend during school recess, scoring a goal in a soccer game, spotting a particularly interesting animal munching apples in our field. Anticipation is also a common thankful topic, as we look forward to a trip or vacation, a holiday or birthday, a visit from far-away friends or cousins. Our thankful things turn out to be more experiential than tangible, materialistic items. Events and people (and pets) are mentioned often. Toys, clothes, and other “stuff” rarely make the list. Sometimes, one of the kids, in a sulky mood, will claim, “I am not thankful for anything.” But the rule is each person has to share two thankful things – has to stop and think about two good things he or she appreciates right then and there. Sometimes the list extends far beyond the required minimum. Often, our thankful things are conversation starters, and it can take half the meal to get through everyone’s turn. Sharing thankful things with my children has crept into my thinking beyond the dinner table. Sure, I still find myself in the occasional foul mood. I get annoyed at bad drivers and mean people, faulty technology and the perpetual need to do laundry. But when I stop to think about all of the things for which I am thankful, the list is overwhelmingly long. Many of my thankful things are mundane necessities, which I am beyond grateful to have. Many are there for the taking – and the giving thanks – if only I pause for a moment and look around me. I am thankful for a home that is not always (ok, hardly ever) clean and has leaky windows and faltering appliances, but is filled with love and the happy chaos of raising children. I am thankful for each of those children – for so many reasons – and for a husband who works ridiculously hard and adores his family. I am thankful for a schedule that, although it sometimes seems unruly, allows me to both be with my children for much of the day and do work that I love. I am thankful for being born where I was and for living where I do and for all the places in which I have traveled and lived. I am thankful that my children are growing up within shouting distance of all four grandparents. I am thankful for friends near and far. I am thankful that my children notice the brightness of the stars, the fullness of the moon, and the beauty of a sunrise and the late day glow on the mountains of home. I am thankful that when we sit down together each evening and reflect on the day just passed and the ones to come, there are many thankful things to be shared. Original content by Meghan McCarthy McPhaul, posted to her Blog: Writings from a full life. This essay also appears in the November 21, 2013 edition of the Littleton Record as Meghan's CLOSE TO HOME column. I remember asking my parents to tell us stories when my brothers and I were kids. We heard the sad account of when my father had scarlet fever and his teddy bear had to be burned. We know about the day he was lost in the neighborhood park of the city where he grew up, and that when he finally returned home, his mother didn’t know whether to hug her little boy or spank him, so overwhelming were both her relief at having him home and her angst over his wandering away. We’ve heard my mother’s memories of being allowed to watch the Mickey Mouse Show if she finished her homework on time. She has told us of endless afternoons wandering the woods around home with her English setter, Lucky, and that she once fell from a tree and landed flat on her back, momentarily knocking the air from her lungs and frightening her own mother into thinking she was dead. As a kid, I could scarcely picture my parents as children, climbing trees and wandering unfamiliar parks. It wasn’t until I was in college, making the long drive home one Thanksgiving weekend with my dad that I finally had the epiphany – as he was telling me a story from his past – that my parents were people long before I came into the world, with separate lives filled with stories all their own. But I still loved hearing those stories as a little girl, even if the characters within were mostly imagined to me. It is the same for my children, as they beseech us to tell our childhood tales. Probably there is magic in knowing Mama and Papa used to be kids who fell down and got into trouble, played with and fought with their siblings, built forts in the woods, and were sometimes sent to their rooms. The kids already have their own stories to tell. Usually these begin, “Mama, remember when…?” As in, “Remember when the bears were in our sandbox?” The bears visited our sandbox when the children were too small to actually remember, but it’s one of the stories we tell, and so it has become a part of our family’s collective memory. We pass many things onto our children, both intentionally and inadvertently – physical traits and bits of our own personalities, our likes and dislikes, our family traditions. They learn from watching us, from living with us for the first however many years of their lives, and from the stories we tell – and the ones we are creating together. For along with telling stories, we are all the while players in our children’s own life narratives, participating in the tales they will someday tell. Original content by Meghan McCarthy McPhaul, posted on her Blog: Writings from a full life. This essay also appears as Meghan's Close to Home column in the November 8, 2013 edition of the Littleton Record. The heat kicked on one morning this week (with the thermostat set at a frugal 55 degrees) and there’s a possibility of snow in the weekend’s forecast. Like it or not – and I know plenty of folks on both sides – winter is coming. The uncommon warmth of the mid-October days this fall lulled me into a sense of continued summer, even as the leaves dropped from the trees and the mornings grew dark. While I’ve been able to slack a bit in preparing for the coming cold, I’ve noticed the animals scurrying about, gathering autumn before it’s too late. I can hardly drive down a back road these days without slowing for a squirrel scampering to hide his winter nuts. The woolly bear caterpillars, so plentiful a few weeks ago, have gone into hiding. 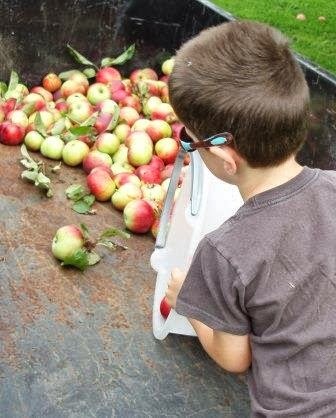 We see bear and deer under the apple trees each evening, filling up on the season’s abundance. The summer cacophony of birdsong has faded to the occasional melancholy cooing of a family of mourning doves that has set up residence in the apple trees nearest the house and the stalwart chickadees who stick around all year. Following the animals’ lead, I will pull the last of this year’s carrots from the ground this week and pick the final handful of green peas – both products of a Hail Mary planting made well past midsummer. The rest of the garden is cleared out, raked smooth, and put to bed for the coming winter, the bounty of wild blueberries from the summer tucked away in the freezer and the applesauce put up in the pantry. It was an odd year for gardening and gathering. The summer started hot and wet, the heat luring me to plant early, the wet saturating many of those first seeds beyond the ability to sprout. And so the garden was a bit of a flop for much of the summer. The peas came in well and seemed to promise more good things to come, but they faded fast. The green beans were nearly nonexistent until my third planting, when persistence finally paid off with a decent, but not spectacular, harvest. The broccoli was a bust, the cucumbers sparse, the carrots so-so. I didn’t even have enough zucchini to give away. Nature, on the other hand, provided in abundance all summer and into fall. We found the first wild blueberries the second week of July, and we picked through the final muggy breath of August. The blackberries provided a decent yield, just as the blueberries began to wither. And in nine summers at this house, I’ve never seen so many apples weighing down the branches of the gone-wild trees dotting the back field. Feathered, furry, or bundled up in increasing layers of clothing, we all spend time during this in-between season gathering autumn, whether savoring the waning warmth of the sun or storing away the fruits of fall, tucking them into root cellars, dark freezers, or squirrels’ dens. As the bears load on an extra layer of fat, we dig out our winter boots and heavy jackets. As the woolly bears curl up against the cold, we replace screens with storm doors and windows. As the deer eat all the fallen apples they can find, we have cooked ours into sauce, filling the kitchen with the warm scent of cinnamon. Even as I lament the passing of one season, I am usually ready to welcome the next. And, so, as I miss the colors of fall and bemoan the gathering darkness of the approaching season, I am also looking forward to winter. In the darkest days of the year, as the wild ones hide away, we’ll bundle up against the chill and head outside to ski and sled, build snowmen, and feather snow angels into the crystal whiteness. By the time the winter solstice arrives, we’ll have mostly forgotten to miss warm days and green grass, distracted by the glow of Christmas tree lights and hot cocoa by a warm fire. And at winter’s end, just when it seems we can’t handle another gray day, leaf buds will form on tree branches, the first crocuses will poke through thawing ground, and the birds will return with their colors and songs, carrying with them the next season, another chance to savor new things and start all over again. Original content by Meghan McCarthyMcPhaul, published on her Blog: Writings from a full life. This essay is also featured in Meghan's Close to Home column in the October 25, 2013 issue of the Littleton Record. A blustery autumn wind blew the power out Monday night, and with it went the lights, my Internet connection, and such other modern luxuries as flushing the toilet and running the dishwasher. The electricity was out for only a few hours, enough time to be a minor annoyance, but not long enough to miss taking a shower or to lose the summer’s bounty of berries stored in the freezer. We lose power a handful of times throughout the year, most often in winter, but thankfully not usually for very long – anywhere from a few hours to a couple of days. With the nuisance factor of a power outage comes the opportunity, by necessity, to alter how we do things. These brief power outages offer a change of pace, a chance to rediscover the allure of reading by the soft glow of candlelight in a normally lit-up world, and a renewed appreciation of some of the flip-of-a-switch conveniences we take for granted. Because our kitchen has a gas stove, cooking without electricity requires only some minor adjustments – a book of matches and a camping lantern by which to see. We keep a two-gallon jug of water in the pantry for such occasions and a slew of flashlights scattered throughout the house. Because I’m a caffeine junkie, I have two back-up, no-electricity-required systems for brewing my morning coffee. Only recently have I obtained a smart phone, which allowed me during this latest outage to check email, keep in touch with my working-late husband, and call PSNH to see when the power might be back on. Losing power no longer means being isolated from the news of the world or the happenings down the road. All in all, it’s not so terrible, really; like most things, it’s all in your perspective. 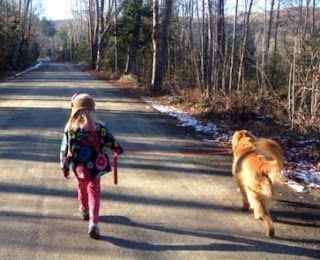 I try to take a cue from my children, who consider the mandatory darkness an adventure. The kids enjoy eating at a table lit by candles. They take glow sticks to bed in the absence of their normal nightlights. Reading bedtime stories by lantern light makes them feel like they’re inside the pages of Little House on the Prairie, even if our lantern is powered by batteries and lit with LED bulbs instead of kerosene and a wick. The spring our twins were infants a Nor’easter knocked trees and power lines down, and we were without electricity for three nights and four days. It was mid-April, but still winter-cold. We blocked off the two entries to our large living room with old blankets, lit a fire in the fireplace, drained the pipes, and hunkered down through the storm. The babies were only three months old then, so sleep was already a scarcity for my husband and me, which made waking to feed the fire every hour or so through those cold, dark nights just one more middle-of-the-night chore. While my husband absconded each morning to his office, where there was electricity and a hot shower, I remained at home in the living room. When I look back on those few days, I don’t recall how much of a hassle it must have been to change diapers and feed myself and my children in a chilly house without electric lights or running water. What I do remember is that, unable to vacuum or do laundry or the dishes, without the distraction of the Internet (no iPhone back then), and before I had returned to paid employment, I read my way through a few books and a couple of magazines. I soaked up the quiet and the warmth from the fireplace and snuggled into a nest of blankets with my new children, the dog, and the two cats. I also remember the morning after the power came back. The winds that had shaken our house a few nights earlier and knocked the power out were gone, along with the mechanic hum of the neighbor’s generator. I bundled the babies into the stroller, grabbed the dog’s leash, and we headed out into the welcome spring sunshine. Birdsong mixed that bright, calm morning with the buzz of chainsaws as crews continued to clear downed trees from roads and utility lines. That day I did lots of laundry, ran the dishwasher, bathed the children. I was relieved by the return to electricity and running water. I had a new appreciation of central heat. And as night fell, I was thankful for such a little thing as flipping a switch and being flooded in light. 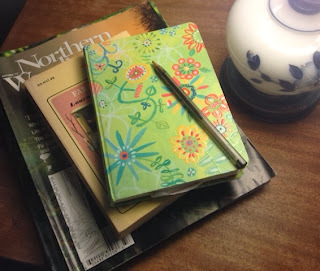 Original content posted by Meghan McCarthy McPhaul on her Blog:Writings From A Full Life. This essay also appears as her Close to Home column in the October 11, 2013 edition of the Littleton Record. 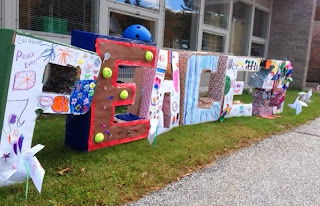 Every year, near the end of September, the elementary school my children attend celebrates International Peace Day. In the weeks leading up to the celebration, the students and teachers discuss ways to be peaceful – respecting others, using kind words, working and playing together. In groups of various ages, the students work together on a project – this year, creating large 3D block letters to spell “Building Peace.” They also make pinwheels to carry peaceful thoughts into the winds and peace flags bearing peaceful colors and words. When the Peace Day projects started at school, my daughter came home singing, a la John Lennon, “All we are saying is give peace a chance.” She filled several pages of paper with colorful hearts and rainbow-hued peace signs and hung them around her room. Did all this thinking of peace make her any less likely to bicker with her siblings? Not necessarily, but it did provide a reference point for how we could act at home, toward each other, to get along – at least most of the time. During Tuesday’s Peace Day assembly, each grade shared its own projects. The fourth graders had reached out to schools around the world to talk about peace. As I looked at the videos and photographs of other elementary school students in other parts of the world discussing what peace means to them, I noticed two things. The first was that the classrooms and the students in these photographs – from Bulgaria, Macedonia, Myanmar, and Korea – could have been classrooms and students from Anytown, U.S.A. The clothing was a bit different, and the languages, of course, but there were the same Smart Boards and student art on classroom walls and the same young faces, eager to learn. Eager for peace. The second revelation was that the students, no matter where they were from, had similar definitions of peace and used similar imagery to describe it. Birds and flowers were popular words used to convey peace. Respect for others, being kind and thoughtful, and thinking of the future were peace-inspiring actions repeated by students from each of the schools. With a constant stream of news that relays anything but peace – violent attacks in Kenya and Pakistan and Washington, D.C., along with the perpetual and tiring squabbling of our nation’s lawmakers – I thought it would be prudent for leaders everywhere to take a cue from the children, to pause for a moment and think about what it takes to be peaceful. One of the quotes shared Tuesday came from a great champion of peace, Mahatma Gandhi: “If we are to teach real peace in this world, and if we are to carry on a real war against war, we shall have to begin with the children.” Celebrating Peace Day seems a good place to start – and showing kids that while other people from other places may hold divergent beliefs and have other traditions, we’re really not that different from each other. We love our families. We like to play with our friends. Problems are best solved when we work together. Beautiful flowers, birdsong, and kindness are peaceful, no matter where you live, what language you speak, or what religion you follow. As I looked around the school assembly and saw the children, from kindergarten through 6th grade, who had worked so hard to create projects for Peace Day and shared them proudly, as I listened to the poems of the 5th and 6th graders and heard the small voices of the 2nd graders joined together to sing, “Doing the right thing isn’t always easy. Doing the easy thing isn’t always right,” I hoped these children would hold onto that desire to do the right thing, the peaceful thing, far beyond the walls of their elementary school. I hope the children around the world will hold onto peace as long as they can, that they will carry it forward into a world that is not always peaceful and inspire all of us to be kinder and more thoughtful, to simply give peace a chance. Original content by Meghan McCarthy McPhaul, posted to her Blog: Writings from a full life. This essay also appears as Meghan's Close To Home column in the September 27, 2013 issue of the Record-Littleton. The frost of the past two mid-September nights has set the woolly bear caterpillars to scurrying. Where they’re going, I’m not sure, but the little black-and-brown ’cats are crawling in droves down the driveway, along the edges of the front porch, and all over the roads near home. I did notice this morning that nearly all the woolly bears I spotted wandering the driveway were headed south, which old-wives-tale logic says foreshadows a “bad” winter. Of course, “bad” winter in normal parlance translates in skier speak to “super snowy winter,” which bodes well for the snow lovers among us. Other woolly bear lore says the coming winter’s weather can be predicted by the width of the middle, brown band of the fuzzy caterpillars. Supposedly, the wider the band, the milder the winter. I didn’t bother to measure the bands of the caterpillars in the driveway this morning… just tried not to step on them. Woolly bears are the pandas of the caterpillar world – and probably the most well recognized, especially by children, who are easily enamored by the furry-looking critters. Pick one up, though, and it’ll curl into a ball, prickly “wool” side out. That’s not so intimidating to humans, but apparently it discourages birds from feasting on the little fuzz balls. Whatever the woolly bears’ stripes and direction of travel say – or don’t say – about the impending winter, their bustling about lately is a sure sign that fall is here. The last two chilly evenings have set the woollies to seeking winter homes. These “bears” are certainly a lot smaller than our real bears – the black bears – but both types hunker down under cover to weather the winter. Woolly bears curl up through the cold months, waiting for spring to cocoon and transform into rather dull-looking yellowish-brown Isabella tiger moths. The woolly bears’ recent activity is a good reminder that even in these days of lingering warmth and sunshine, it’s time to put up the firewood, clean out the gardens, and hang the storm windows. Winter is coming; I, for one, hope all those south-bound woollies are telling us it’ll be a snowy one. You don’t have to travel far through rural New England to find reminders of old farms. They are evidenced by tired barns sagging in unkempt fields, stone walls meandering along roadsides or forgotten and crumbling in places it seems impossible there was ever an open meadow, and houses that stretch from front porch to back ell to shed to barn, all connected over time and with towns often grown up around them where there used to be pastures. There are still working farms here, of course, but the landscape – in town and country both – tell us there used to be more. In my daily meanderings, I regularly pass two old farms. Both have been farms for many generations and have evolved over the decades in various ways. Both have also sat idle for many years. And in recent weeks both have exhibited new signs of life. The first is known as Iris Farm, although the sign bearing that name no longer hangs from the post at the end of the driveway. Less than a century ago Iris Farm boasted a proud herd of Ayrshire, which provided milk for local schools and hotels, including the nearby upscale Pecketts-on-Sugar-Hill, which was owned by the same family. More recently its fields have held Highland cattle, a couple of horses, and a flock of sheep whose lambs were a happy, fuzzy harbinger of spring. Red-winged blackbirds still chitter away from the fence posts in summer, and swallows still swoop around the barnyard, but the farmhouse and barn have been vacant for a couple of years or longer. Without the animals and the big round bales of hay in the fields, Iris Farm has seemed lonely. So when a small herd of big, black Angus cattle appeared this month people noticed. To tourists traveling along the picturesque road, those cows are probably just another part of the pretty scenery. To those of us who go by the farm each day, they are a welcome sign of life on a quiet, old farm – an indication that, while the farm is not the bustling place it once was, the barn won’t likely be allowed to rot to the point of collapse, and the fields will remain open to the mountain view. Ski Hearth Farm, a few miles away, has likewise cycled through changes over time. A hundred years ago it was a small dairy farm, not unlike Iris Farm and other small dairy farms all over this region. Mere days before the Hurricane of ’38 knocked down much of the farm’s timber and flooded the basement of the farmhouse where the year’s crop of root vegetables was stored, newlyweds Sel and Paulie Hannah purchased the property. The Hannahs changed the name from Temple Farm to Ski Hearth Farm, a nod to the property’s new dual purpose of raising food during the growing season and housing skiers through the winter. Ski Hearth evolved into a truck farm, carting vegetables to restaurants and markets around the area and famous for “Sel Hannah’s potatoes.” When Sel died in the early 1990s, his daughter Joan came home from Colorado to run the farm, which she did for a good many years before putting it up for sale. Since Joan sold the farm, it has had three new owners, a name change, and – for the past several growing seasons – dormant fields. Last month Davis Mangold purchased the farm. He grew up on a farm in Kentucky, became the first in his family to attend college, and started (and still runs) a successful business. Mangold says he never thought he’d want to return to farming – until one day he did. 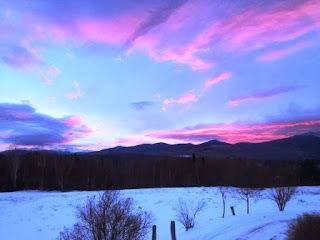 Besides reviving the Ski Hearth Farm name, Mangold and his crew are also hard at work reviving the fields, the farmhouse, and the locally cherished and sorely missed farm stand. The first crop – six neat rows of strawberries – has been planted in preparation for next spring. Bright new chicken coops now fill some space in the back fields. There are often tractors in the fields these late summer days, plowing and harrowing and planting. There’s something forlorn about an empty barn and barnyard, indications all around of someone’s long, hard work – life’s work, often many generations’ worth – at some point, for some reason, abandoned. And there’s something beautifully hopeful about seeing animals return to a pasture and crops return to a field, watching an old farm welcoming new life. Original content by Meghan McCarthy McPhaul, posted to her Blog: Writings from a full life. A version of this essay also appears in the September 13, 2013 edition of the Record-Littleton.